Trust is not easy to come by these days. But one Towing Service is committed to earning and delivering it. This Towing Service is Southside Towing. 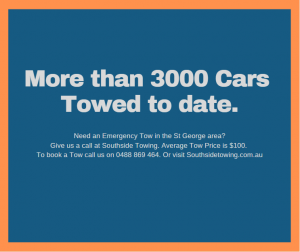 If an Emergency Towing Service you can Trust is important to you, then Southside Towing is a name you can’t go past. Has your car, van or SUV broken down in St George? If the answer is yes, please call us. All our drivers are professional Tow Truck Drivers who are licensed by the RTA. Each holds a valid Tow Truck Driver Certificate issued by the Department of Fair Trade, New South Wales. At Southside Towing, we know what our customers want. Their Towing Service to arrive faster than the next Android update. So, we station our Tow Trucks in different suburbs in Sydney’s South. This allows us to get a truck to you when you have an accident or breakdown in St. George within 31 minutes or less. They can fix minor mechanical issues as well to get you back on the road again. If you’re out of petrol, we can lend you some to get you to the next petrol station yourself. Or we can tow you to it, if you prefer. You can choose from many different types of Tow Trucks we have at Southside Towing. Standard Towing Vehicles or Flatbed Tow Trucks. These allow us to lift your entire vehicle off the road, so the wheels don’t touch it. This keeps your vehicle safe. Preventing further damage to it. We enjoy helping people get their vehicles to safety. It gives us a rush to be quite honest, which is why we do it. To date, we have towed more than 3000 vehicles in Sydney’s South and surrounding suburbs. Need an Emergency Tow in the Liverpool area?